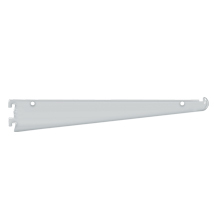 Long lasting and attractive chrome shelf brackets are used with wood, glass or plastic shelving. When using glass shelves, glass shelf rests are needed #2781, #2782, #2783. Fits 1/2 in. slots, 1 in. on center.